His Grace, Bishop Irénée of Québec City, represented the Orthodox Church in America at the funeral of His Beatitude, Patriarch Ignatius IV of Antioch and All the East, at Saint Nicholas Church, Beirut, Lebanon on Sunday, December 9, 2012. The funeral followed the celebration of the Divine Liturgy. His All Holiness, Ecumenical Patriarch Bartholomew of Constantinople, presided at the funeral, at which all hierarchs present concelebrated. The following day, services were celebrated at the Patriarchal Cathedral in Damascus, after which Patriarch Ignatius was interred at the Patriarchal Cemetery. Bishop Irénée noted that few, if any, members of delegations from sister Orthodox Churches traveled to Damascus. 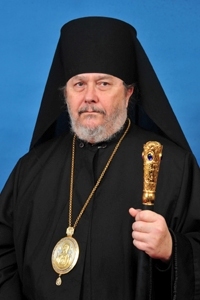 While in Beirut, Bishop Irénée spoke with members of various delegations, including Patriarch Bartholomew; His Eminence, Archbishop Sabba, Locum Tenens of the Antiochian Patriarchal Throne; His Eminence, Metropolitan Hilarion [Alfeyev] and Archpriest Nikolai Balashov of the Russian Orthodox Church; representatives of the Church of Georgia; and others. Bishop Irénée flew to Beirut from Moscow, where he had been on a private pilgrimage since November 23. While in Moscow, Bishop Irénée celebrated the Divine Liturgy at the OCA Representation Church of the Great Martyr Catherine on Sunday, November 25 and Sunday, December 2. He brought with him a belt belonging to Saint John of San Francisco, which is kept in Canada, that was made available to the faithful. It will remain in the church through December. On December 4, Bishop Irénée presided at the Divine Liturgy in Kronstadt.